You’ve probably heard all the buzz about confetti cannons and that they’re a must-have to make your event magical and memorable. Are you still wondering “what exactly is a confetti cannon” and how will it work for me? The Flutter FETTI team of experts is here to guide you through the process of selecting the ideal product that will work in your venue and meet your needs. While the name “cannon” may strike up images of something from medieval times, our confetti cannons are truly cutting edge. Confetti cannons actually come in all shapes and sizes. From pocket sized Flutter Flickers that launch a shower of confetti with a simple flick of a wrist, to our Co2 operated cannons for that big bang effect, there’s a Flutter FETTI cannon just waiting to add that WOW factor. Height is never an issue as our confetti cannons can be used in venues with ceilings as low as 9 feet to outdoor venues with no ceiling. Depending on your confetti cannon selection, the confetti will fly, float, and flutter from 15 feet to an astounding 100 feet into the air! It’s your party and you can confetti how you want to with so many customizable options. Flutter FETTI understands the importance of the overall effect and that’s one of the reasons we offer such a wide variety of customizable colors and confetti shapes (stars, butterflies, and hearts to name a few). In addition to confetti, a number of our confetti cannons shoot off captivating metallic streamers, confetti strips, and tissue bubbles. The possibilities are endless…just bring your imagination! 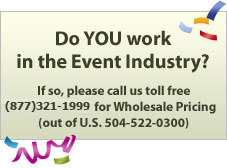 Do you work in the Party and Event Planning industry? Purchasing our confetti cannons is an excellent investment for long term use and profit. The ability to offer your clientele the option of using a confetti cannon at their venue sets you apart from the rest. In addition to purchasing our cannons for long term use, Flutter FETTI offers the flexibility to rent cannons for “one-time” events such as a 50th Birthday Party, Baby Shower, or Grand Opening. Renting helps keep your budget on target. Thinking about a variety of cannons? Choosing the rental option gives you the opportunity to try before you buy and identify the exact confetti cannons you’ll need for future events. If you rent a confetti cannon and then decide it’s a “must have” and you’d like to purchase it, Flutter FETTI gives you a fantastic purchase incentive. You can apply your recent rental fee toward your purchase, acting as an immediate discount on the full purchase price of the equipment. Still have questions on which confetti cannon is right for you? Contact one of our creative Confettiologists Toll Free at 877-321-1999 (outside of the U.S. at 504-522-0300) or email us now and we’ll find the ideal product match to add the ultimate effect to your event. Read on to review our entire catalog of confetti cannons along with some fun and fabulous inspirational ideas. Let the confetti blow! Our Continuous Flow Confetti Blower uses Tissue or Metallic Flutter FETTI or Tissue Corkscrews. It will blow products 40 feet high into the air! Sending the confetti and corkscrews sky high is easy…simply keep feeding the confetti products into the tube to have a continuous flow effect. Flutter FETTI’s Continuous Flow Confetti Cannon rental uses 110 Volt electricity to operate. It’s also available for purchase in 220 Volt. Perfect for events that need a continuous flow effect in a small area! This confetti cannon is small but mighty! Designed for small or moderate size venues, the Continuous Flow Baby Gerb Confetti Cannon offers multi-level launch positions. It easily moves around and can even be placed on a table or stage floor. The hopper can hold 1 lb. of Flutter FETTI. There are two options to release the confetti: either push the control button down, hold it, and all the Flutter FETTI will fly out at once or you can push and release the control button up to 5 times discharging the confetti each time for short bursts. The Baby Gerb provides a spectacular special effect in a small package! Our 3" Continuous Flow Confetti Cannon can launch 1 lb. of confetti products per second up to 75 feet high! Use our Tissue or Metallic Flutter FETTI, Tissue Corkscrews, or our Die-Cut Confetti products in this machine. When you rent or purchase our 3" Continuous Flow Confetti Cannon, all the necessary hoses come with the equipment. Customers love using all white Tissue Corkscrews which spiral downward mixed with silver and gold Metallic Flutter FETTI. The Flutter FETTI Confetti flutters, flies, and floats downward creating a beautiful "upscale" special effect! Our 6” Continuous Flow Confetti Cannon is an absolute crowd pleaser. People will be completely amazed as our 6” Gerb shoots 1 lb. of confetti products 100 feet high into the air per second! It’s as simple as continuously adding the Flutter FETTI confetti products into the hopper of the 6” Gerb machine and watch in amazement as a GIGANTIC WALL of confetti erupts! The master of all ceremonies – our Master Blaster Co2 Confetti Cannon has a 42 inch long barrel and is totally versatile as it’s a hand-held cannon that can be positioned anywhere you need during your event! You can load either four 9" speed load tubes or two 18" speed load tubes into the barrel. You can also load 15 pieces of our large confetti streamers or double wrapped confetti into the barrel. The trigger unit of the cannon uses a 16-gram threaded Co2 cylinder. You’ll need one Co2 cylinder per shot. It shoots our 18 inch speed load tubesof Tissue Flutter FETTI confetti 35 feet into the air. If we double wrap our tissue Flutter FETTI confetti, it will fly up to 40 feet into the air! The Mega Blaster Hand Held Co2 Confetti Cannon is designed to use 2" poly bags of products that give a fabulous full burst of confetti products into the air. The Flutter FETTI Team designed the Mega Blaster so those of you who own our Master Blaster Cannon can use the same trigger unit with this cannon barrel. This portable cannon uses the power of Co2 to shoot confetti and streamers high into the air! Our 9-Barrel POD Remote Control Confetti Cannon will shoot our 2" x 40’ long large streamer and confetti products 85 feet into the air in various pre-programmed sequences! If you're looking for a safe substitute for fireworks, the 9-Barrel POD is your answer. A programmable, on-board micro-processor can be programmed to fire off all the barrels at once or in a staggered firing configuration. You can even link POD units together for extended programs. If your ceilings aren't that high, the 9 barrels can be loaded with our speed load tubs of products and will fly 35 feet high. Whatever FETTI product you load, we GUARANTEE the 9-Barrel POD will cause excitement with this incredible action cannon! Our Quarter TurnHandheld Co2 Confetti Cannon is 21" X 1". Simplicity makes this confetti cannon so easy to use. Our Metallic Confetti products will shoot 40 feet into the air and our Tissue Confetti products will shoot 30 feet into the air! You can either use two 9" Speed Load tubes in this Co2 cannon or one 18" Speed Load tube of product. Choose from 9" Speed Load Tube w/Metallic Streamers & Tissue Bubbles,9" Speed Load Tube w/Metallic Streamers and Metallic FETTI, 18" Speed Load Confetti Tube w/Tissue Corkscrews and many more! We recommend capping and taping the cannon barrel before shooting it, because the cap builds pressure inside the barrel making the products shoot higher into the air. To use the Surprise Box Continuous Flow Confetti Cannon, you simply drop in our Bulk Confetti such as Tissue or Metallic Flutter FETTI, Tissue Corkscrews, or Die Cut confetti products. The Surprise Box uses a 5-lb. liquid siphon Co2 tank to send our products soaring! Pull up the lid of the Surprise Box and the confetti products inside will fly up and flutter all around! The smiles and cheers as the “present” is opened will make memories to last a lifetime. Finally, an affordable battery-operated cannon equipped with a wireless transmitter which has a unique numeric code to prevent misfires. Our transmitter can be programmed to fire all the centerpieces off at once or in a staggered firing configuration. Your guests will be surprised and "WOWED" as the battery-operated tabletop confetti cannon explodes with magic and fun! The X-6 Double Barrel Wireless Confetti Cannon is truly a showstopper! This double-barrel confetti cannon can be hung from a lighting grid with a C-Clamp or it can sit on a stage floor. The 2 barrels can be separated and used as two separate confetti cannons. Customize your colors with our 2″ x 40′ long Tissue Streamers that shoot 80 feet into the air and 2" X 40' long Metallic Streamers that shoot 100 feet into the air. These streamers add major festivity to any event!